The story of the Guild is a story of women helping women and holding governments accountable. As the organisation lobbied for benefits and recognition for members, it provided succour to grieving war widows. Women of the Guild did both with aplomb — using that aplomb with devastating effect on any who thought they were merely benign women in need of an external guiding hand. Immediately after World War II many war widows were adrift — often voiceless, suffering economic hardship and forgotten in the celebratory aftermath of war when commitments made to servicemen in the tumult of wartime were overlooked. Mrs Jessie Vasey established the Guild in 1945 in Victoria and in New South Wales in 1946. The Guild is a national organisation representing war widows — many thousands over the years — who banded together behind their leadership and lobbied for benefits for war widows. This is the history of the Guild in New South Wales: a not-for-profit company limited by guarantee whose mission is to promote and protect the interests of war widows. Established by women and for women, the Guild has fought to improve the financial and social circumstances of members. What makes the story of these women extraordinary is that at the same time they were lobbying the Prime Minister and dealing with bank managers (at a time when both were uncommon for women), attending international conferences and securing global networks, they were also dealing with the practicalities of managing Guild housing and the minutiae of tenants who complained of draughts, irritated neighbours by using brown paper instead of toilet paper or emptied tea leaves down the toilet! The Guild believes it is the largest organisation in the world providing housing for war widows and advocating for their benefits. It certainly ranks as one of the largest women’s pressure groups in Australia and for many years the Guild in NSW has been the largest state body with a membership of 12,732 in March 2006. Some women ask, why join — I have everything I need. And so they do — because of the Guild. Every war widow, whether a member or not, has benefited from the efforts of the Guild — collectively through its office-bearers as well as the drive and energy of its members. The complex stories woven through the Guild’s records has made the task of writing its history a challenge. The Guild commissioned a much shorter history but as the stories of the women of the NSW Guild emerged it became another challenge to capture more than a flavour of their stories. Countless other stories fell to the cutting floor. 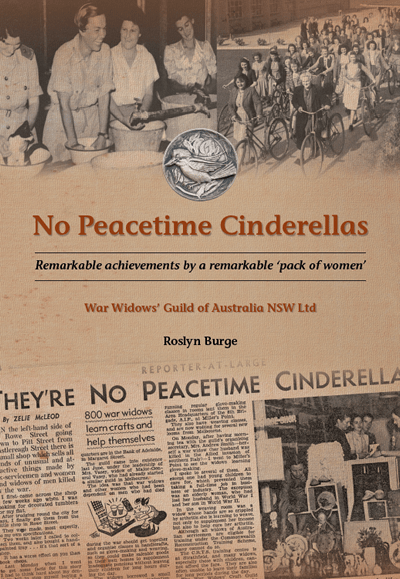 To purchase a copy of No Peacetime Cinderellas, please contact the Guild. Roslyn Burge is a Sydney based freelance historian. Her work involves research and written history, conducting historical walking tours, curating exhibitions, including an outdoor photographic exhibition in the gardens of Broughton Hall, and recording and documenting commissioned oral history projects. A number of these have been particularly place-based, such as Sydney’s northern beaches in the 1930s; Goat Island in the 1940s; Hartley in the twentieth century; and the Tamil community of Strathfield. Roslyn has a Masters degree in Public History from the University of Technology, Sydney. Her publications include “Hiking for Health” (a facsimile reproduction of a 1936 publication about hiking on Sydney’s northern beaches utilising contemporary oral history extracts) and “Tamil Oral History Project” (in Strathfield). Patricia Campbell was the Chief Executive Officer of the War Widows’ Guild of Australia NSW Ltd from 2000-2017. Her academic qualifications are MBA(Exec) UNSW, BA Syd, DipEd UNE. Her professional background is in management in the Commonwealth and State Governments, and she spent three years as a Member of the Veterans’ Review Board, appointed by the Minister of Veterans’ Affairs, before joining the Guild in 2000. Jan Stevens joined the Guild as the Manager of Member Services in 1998. She manages the welfare, housing and events activities of the Guild. Jan’s career spans many years in nursing. Having acquired a management degree – BHSc(Mgt) CSturt, she spent several years in administration in private hospitals. Selecting photographs and organising the production for this amazing story has been enlightening, engrossing, challenging and inspirational. The struggles faced by war widows in the late 1940s and beyond have contributed to their status and well-being today. This is a remarkable story of achievement by women for women.